Pam Kirk, a professor in the School of Nursing and Healthcare Leadership introduces herself and shares her story about how she became a nurse. Check it out. If there are any questions they can be directed to nursing@mnstate.edu. Hope everyone is having a safe and enjoyable break! National Hand Washing Awareness Month! It comes as no surprise that the beginning of Flu season is the beginning of National Hand Washing Awareness Month. Each day our hands com into contact with multiple microorganisms. They could be anywhere, including the railing of a staircase, keyboard or phone. All of these daily occurrences can put us at risk for germs and bacteria that could potentially make us sick. This is why hand washing is very important. Follow these suggestions to protect yourself from potential illnesses. The CDC says that soap and water is the best way to wash your hands but if it is not available then you should always carry a bottle of hand sanitizer that is made up of at least 60% alcohol. The Student Healthcare Leadership Organization is made up of mainly Community Health and Healthcare Administration Services majors. However, the student Organization is open to all students interested in health. The organization on campus commonly reaches out to the community to volunteer. Recently, on November 27th, a group of students went to River Pointe; a senior care facility. 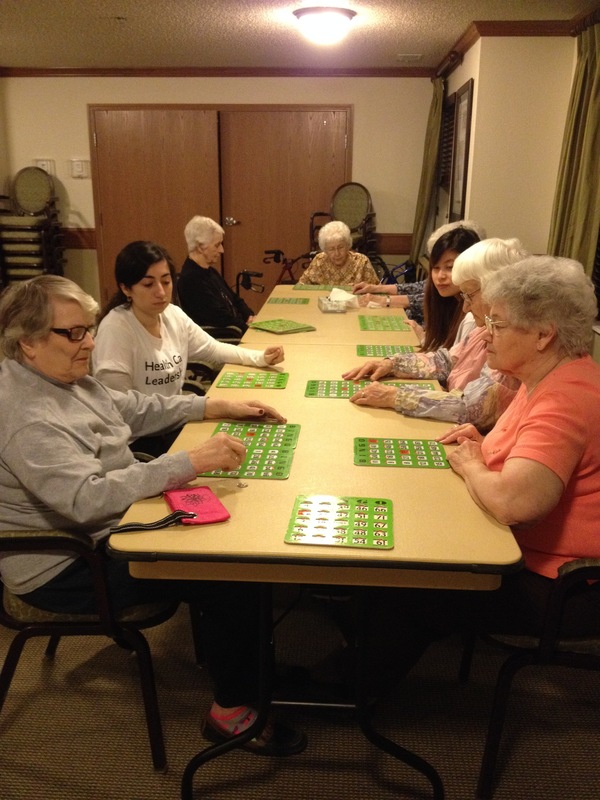 While at River Pointe, students helped residents play Bingo by calling off numbers. The residents were extremely pleased that the students had made time to come visit them and were enthusiastic about the idea of the students returning. The Student Healthcare Leadership Organization plans to continue volunteering and recruitment in the Spring 2014 semester. All are welcome. The fall Community of Interest meeting is being held today, December 13th, 2013. The meeting will take place at MSUM in the Comstock Memorial Union, Room 101 from 11am until 1 pm. A light luncheon will be served for those in attendance, which include MSUM faculty and area healthcare leaders. The Community of Interest meeting is hosted by the School of Nursing & Healthcare Leadership to gain insight on the needs of the ever changing healthcare industry from area healthcare employers. Information gathered from the meeting is used to keep the School of Nursing & Healthcare Leadership educational curriculums up to date with the needs of the industry. The Master of Healthcare Administration (MHA) program provides students with the skills and experience to be competitive in a variety of professional settings. Building on students’ existing leadership skills, management styles and current understanding of healthcare policy in the highly regulated healthcare industry, students will be able to dynamically contribute to the improvement of the delivery of services throughout the healthcare continuum. Melanie Schicker, a faculty member for the MHA program share some key information. Who can apply for the MHA program? How is the MHA program beneficial? What does the MHA prodragm focus on? The program focuses on decision-making and effectiveness for healthcare executives which can help improve the lives of the people they serve or will serve in healthcare. We focus on the ethical and social responsibility that every healthcare leader must possess. What can you do with an MHA degree? Graduates of the Master of Healthcare Administration can work in multiple settings, rural and urban, large and small facilities, practices or other healthcare settings. Graduates may serve in many capacities in healthcare including department management, specialty area management, executive positions, physician practices and much more. How much is an MHA degree? At MSUM, The rate is $337/credit hour with a fee of $55/credit hour differential tuition for online courses. The program is 37 credits. Application deadlines vary per semester, but generally students may register up to the start of classes. It is advised to register early to ensure a seat in the class. Why is the MHA program important to you? It is essential that we have strong leaders in healthcare who hold the highest ethical standards, are committed to community, diversity and patient advocacy. At MSUM, this is our focus.